Habitat: Desert, Upland. 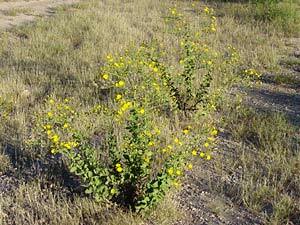 This weedy wildflower grows in disturbed areas and is a common roadside plant. Flowering Season: Spring, Summer, Fall. The peak bloom time is in the late summer and early fall after the summer monsoon rains. Description: The flowers are loosely clustered at the tips of the upper branched stems. 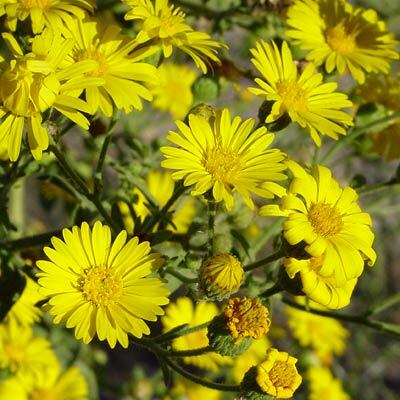 The individual flower heads are 1 inch (2.5 cm) wide and ringed with slender, overlapping, yellow rays. The flowers are followed by fluffy, tan seed heads. The leaves mostly line the lower part of the unbranched main stems and are green, hairy, sessile, and rounded to egg-shaped. The stems are green, hairy, upright, unbranched below, and well-branched above, giving this plant a very distinctive shape. Foul-smelling – The foliage reeks of camphor when handled or crushed and can leave the smell on your hands.